Remember when kale chips were all the rage? Well, they're so over now! OK, maybe they're still raging. My supermarket now sells them ready made in little 3 serving containers...for $7.00! At those prices they'd better still be raging but they're definitely over in my kitchen. I sort of liked them, kind of, for someone who doesn't generally like kale all that much. Brian ate the first batch I made last year and decided they were over back then. The net net was that, if you made them for me, I would eat them but I usually didn't bother making them for myself. But spinach... that's a whole 'nother thing. I like spinach in almost every form so why not make chips? I'm brilliant! OK, it took me a year to think of this so my brilliance is on a slight time delay. Also, I'm not the first to make spinach chips. But, whatever. 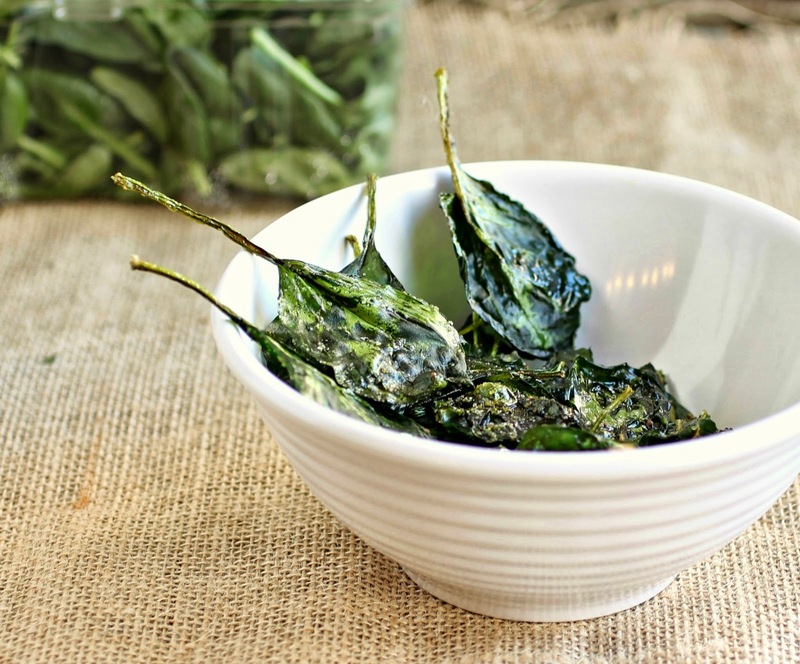 Spinach chips are raging completely out of control! And they're easier to make. Kale is like a wild, frizzy, out of control hair do. But you can buy containers with pre-washed baby spinach leaves so you don't even have to wrestle with them. Lay them neatly on a baking sheet and they stay neat. And they have little handles. They're perfect, I tell you! Definitely the new cool kid in town. Kale? Kale who? Enjoy! YES! I'm not in love with kale chips either but def. think I could get down with some spinach chips! 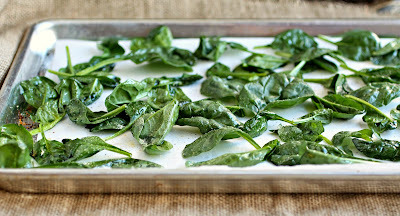 I'm a major spinach lover, so heck yes... let's RAGE on! We probably SHOULD come up with a truly healthy(ier) dip, because what's a chip without its partner for dunking? 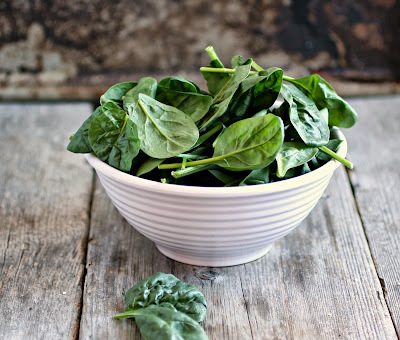 Kale, spinach, I'll take either! If it's green, it's good, in my book. I think I could eat a whole pan full of these too, Anita. I can't wait to make these. My work makes fried spinach to put on top of flatbreads. I love it, but it is not healthy. So I started searching for a good baked spinach chip recipe. I found your blog tonight and immediately made them! I tried kale chips once and was not a fan. Love these, and the only downfall is that the "handles" make it so much more tempting to grab them right off the sheet before they cool down. Yup, I'd much rather have your spinach chips than kale. Genius!!! I love this and cannot wait to try it! I had NO CLUE that you could do this to spinach! I'm turning on my oven right now! These are SO GOOD. Thanks! I just made these and they are delicious! Thank you! These were ok. Brussel sprout chips are wicked better though. I just made these and added crushed red pepper and nutritional yeast. It was so freaking good I ate a quarter of it straight out the bowl raw! These are awesome!!! Can't keep my hands off of them! I made these last night and immediately after they were crunchy. However, I put some in a tupperware to bring with me to work today and when I opened it they were soft. Still tasted delicious (because hello spinach) but I really wanted that crunch. Any suggestions? I put mine in a sandwich bag the next day, and they were still crunchy. I love this recipe! I tried it 3 times and my mom and co-workers enjoyed it! It definitely offers a healthy option to satisfy that craving for salt that I may have at times. Bye bye salt and vinegar chips and corn curls. Just pulled these out of the oven. They are SO DELICIOUS. I ended up using the garlic powder. Question though - how should these be stored? Fridge or not? Closed or open container? Hi Ash! To be honest, we've never had leftovers to store. haha. I would cover them loosely with aluminum foil and leave them out of the refrigerator but let me know how they do. Happy Thanksgiving! There should be a video to go with it, it'd be very helpful!